Lviv City Council and Lviv municipal enterprise Green City have submitted an application to the European Bank for Reconstruction and Development (EBRD) to receive a loan to finance the first stage of the rehabilitation of the Hrybovychi solid household waste landfill and build waste sorting and composting facilities in Lviv. An estimated value of the project is estimated at EUR 35 million. "The tendering for the above contracts is expected to commence in Q4 2017," the EBRD said on its website. The bank is looking for companies which could be interested in the rehabilitation of Hrybovychi landfill and construction of waste mechanical and biological treatment facilities. 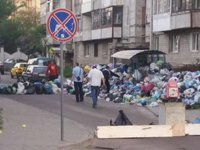 As reported, on May 30, a landslide of over 100,000 cubic meters of garbage happened at the city dump near the village of Hrybovychi outside Lviv. As a result, four people were trapped under the garbage and killed. The landfill as shut down and Lviv had to remove its waste to the landfills of other cities and regions. Lviv City Council and Egis signed a memorandum of cooperation, according to which the company will design a project on reclamation of the Hrybovychi landfill for Lviv and the project on the new waste recycling complex. A grant of the French government of EUR 650,000 will be used to finance the works.